Sharer ad what do you think?? I want to get a sharer for my mare for when she returns from schooling livery as I don't think I will have the time needed to keep up her current workload,which I would like to do as she is doing well on it and needs to carry on getting fitter. 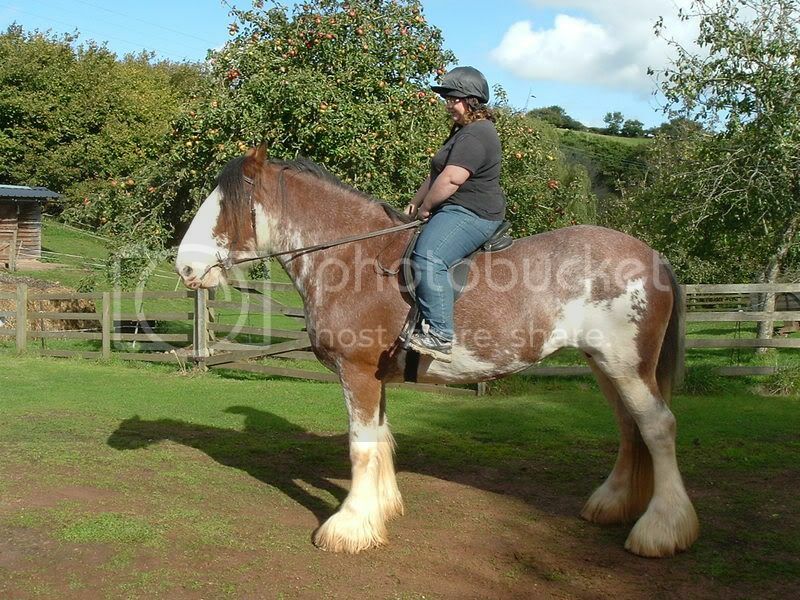 sharer wanted for 16.2 clydesdale mare. Confident and capeable rider required as although very safe can be foreward going. To be ridden two or possibly three times a week,short rides at present to build up fitness level as only recently brought back into work. No costs involved but some help with chores appreciated. Own transport essential as although only 6 miles from Exeter,is a bit out in the sticks!! Basically my mare is very safe but can be foreward going,and add to this the person sharing would have to ride out on their own,I thought it best to get someone fairly confident and capeable?? Although she is very safe and sane and will just as happily plod about with a novice,but didn't think that really suitable for now? ?There is also the fact that she is a bit green schooling wise,although has been doing very well at schooling livery and want that to continue so want her to have decent rider (to make up for my not so good riding lol) Do you think I should mention that in ad or wait until they phone so as not to make ad an essay?? I don't know what to do really,don't want to put people off by making her sound bad (which I think I may have done with that ad),but want someone I feel I can happily leave to it all without having to worry. There are no other liveries at the yard so will be no help available,although I will happily do what I can of course,but will be no back up if you know what I mean. Confident and capable rider required as although very safe can be forward going. To be ridden two or possibly three times a week, week days and weekends. short rides at present to build up fitness level as only recently brought back into work. Own transport essential as although only 6 miles from Exeter, yard is not near a bus route. Jay, you are so good at these sort of things! Both those adverts sound good to me! No costs involved but some help with turnout/mucking out etc. Good point about the roads,didn't think of that. Do you think I should put turnout/mucking out or just chores/stable duties etc as am not sure what I would want them to do at present and depends when they could be there etc?? Also forgot to mention weekend riding most definitely available (as I am not there weekends hardly),should I put that in as might appeal more?? Absolutely mention weekends, a big selling point! I think both ads are very good. I don't think you make her sound bad at all!! I think you do have to be specific about wanting a confident capable rider. I'd be very tempted being currently horseless! If only I wasn't 300 odd miles from you!! As Jaydevon said, it's good to mention roads and hacking! Just gives people an idea of what you want her to do. I think many would jump at the chance especially as you mention no cost involved. Ideal for students, especially if they are doing an equine course which involves horse care anyway! I love the bit about wine/fags etc too. I think that adds a touch of humour and makes the ad stand out!! Where will you advertise? I think title is very important as that's the first thing people will see initally. Then you want them clicking that mouse from the list of all the others to get to see the details. I see too many ads with just "sharer wanted" I think it helps when people put location in the title too. As someone who looks at ads all the time I know that always draws me to have a closer look! If only I could think of a good title though!! I'll have a think while I do the housework (off topic but should have started it hours ago but too addicted to this site!!!! ). Yes agree! Definately mention weekends!!!! I struggle with weekends with having kids etc,so hardly go to the yard at all,but I suppose for someone who works during the week,they would prefer weekends?? So many things to think of to go into a small ad!! all have a unlimited word allowence and are free to advertise! Lot's of good points thank you. Am glad I am not making her sound bad,she is a poppet really,reliable dependable neddy type.Just really want a decent rider to carry on her current work,and think someone confident would be best as they will be pretty much on their own with her in all ways not just riding. Was going to do free ads and on here,but didn't think of the other two will have a look. Was going to put one up at local feedstore as well.Any other ideas?? That's another good one! Free ads too!! Sounds fine to me, you should get replies, I've put in ads and replied to adds. Being honest is always best way. You might want to consider contribution towards costs ie shoeing, I've paid half the cost before and i've helped with feeding, mucking out and tack cleaning, i don't just want free ride. Think of later when the horse is fit and ground dries up, the person could be having lots of fun on your horse. Other point, make sure they ARE happy to bring into work, ask them about how long it takes etc, find out what their knowledge is. What's a short hack to you, cos hour to me is short and average, will they do what you ask. Let them know where horse is on fitness scale and find out how they will get fitter. Some people just ride they don't know about tendons and fittening programmes etc. Esp. as saying no contribution, you could be inundated with people just wanting free ride. Good luck the right person will come along, your just click and your get on fine. special horse needs special sharer. Thank you,will check that out. Just thought would add a pic of the big girl in case it helps inspire anyone,(or encourages anyone who might be interested,know someone who is etc!! )this is Jaydevon riding a few weeks ago. Good points,am worrying again now,this is all such a minefield!! On shoeing front,she is barefoot so cost not so much an issue,but is worth considering in relation to work they may be doing.Like you say might be doing loads with her once she's fit,and then she might require boots so is the cost of that to factor in I guess,but I am quite happy to pay for everything as long as she get's the correct work and care,but thank you for bringing to my attention.Maybe I should put no cost involved initially,but consider it when she's fit and they can do lot's more with her?? The fitness thing I will most definitely make sure they are aware of.Will probably draw up some sort of plan for the next two months,after which she should be at full fitness. I do NOT want anyone jumping her,should I mention this in ad or wait until they phone?? I am assuming anyone interested in this type of horse will not really be thinking of showjumping anyway,but should I mention it?? There is no health reason she can't jump BTW and *maybe* when she is fully fit I will consider her popping the odd log,but that is a big maybe.I just don't think these type of horses are meant for jumping,I know they *can* and some people do jump them before anyone jumps on me ,but I personally don't think they should due to them not being built for it and the strain on the joints.Just my opinion,and like I said I may change it with time,but for now it's a no no. mate if you add the bum piccies, im going up to de hair tonight! ha! go on i dare you... or i may dye her tash an awful colour... LOL dont think i wouldnt! if its hacking only and knowing you dont have a school, i cant see jumping coming into it! dont put to much in the add, fitness routine etc is the stuff for a fone call. have a look through the wanted ads mate, you may trip upon someone advertising for wanted horse.